As long as the voter registration application requires a residential address while admonishing the applicant that providing false information on the form is a crime, there will be a built-in contradiction in the process. I’m still surprised that no articles, to my knowledge, have yet cited the court order that the Harris County VR operates under, requiring them to accept any address as long as it can be verified as an actual physical address. 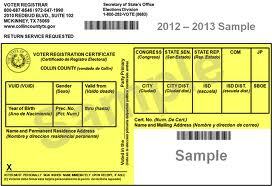 With that in place, what would be the basis for challenging anyone’s use of a business address or postal box on a voter registration application submitted to the Harris county VR? If dave wilson is smart enough to trick people into believing he could be black and live in the hcc district. Oh well. But then again… we’re still waiting for charles to ask real questions to houston city council candidates. It’s really not that hard to google company and government ideas and compare them to competitors. It’s kind of embarrassing when ceo’s and politicians have to privately and publicly ask an unemployed gringo with a spanish degree how to improve employee benefits and run the 4th largest city with ideas he googled. But then again. I don’t see any other millenials writing dozens/hundreds on how to run the 4th largest city.